When the new University College London Hospital was planned and built on Euston Road in London it was decided that the Laboratory Services would remain in their original location in Whitfield Street approximately 0.5 km away on the opposite side of the busy Tottenham Court Road; one of the busiest thoroughfares in London. The problem to solve was how to transport the various specimens and samples between the New Hospital and the remote Laboratories. Various solutions were considered, but in the end it was decided that extending the Pneumatic Tube System to connect the buildings was the most practical and cost-effective solution. 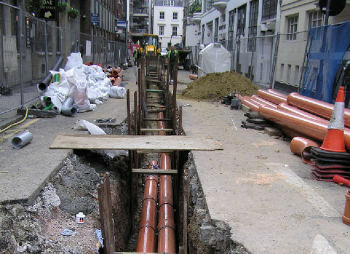 Although easy in theory, the challenge was to physically run 4 x 160mm tubes along the interconnecting route, much of which would require installation underground. Whilst plans and maps were studied, and above-ground surveys carried out, it was impossible to ascertain with any certainty what was actually in the ground. This area of London, like many others, suffered much disruption during WW2, with services quickly repaired and reinstated as they became damaged, hence detailed knowledge of below ground structures and services is incomplete, through a lack of documentation. This meant that although work programmes were planned and road closures scheduled, the works started with some trepidation as to whether the route was actually achievable. Fortunately no insurmountable problems were encountered, although an undocumented large concrete structure was discovered part way along the route, with just enough clearance to allow installation of the four tubes. Each 160mm PTS tube was installed inside a 250mm mechanical protection outer tube. This method of construction providing for the greatest flexibility to manipulate the route around other services. The deepest part of the tube route is as it crosses Tottenham Court Road where the tube descends to around 3.5m below ground level to clear other services. Interestingly, the new pneumatic tube route for UCLH crosses the track of the original Pneumatic Mail Train installed for The Post Office in 1859; one of the first applications of pneumatic delivery systems. By the end of 2016 the Pneumatic Tube System connecting UCLH with the remote laboratories will have been in operation for 10 years. During that time the connection has been modified to incorporate the new Cancer Centre part way between the two original terminations. 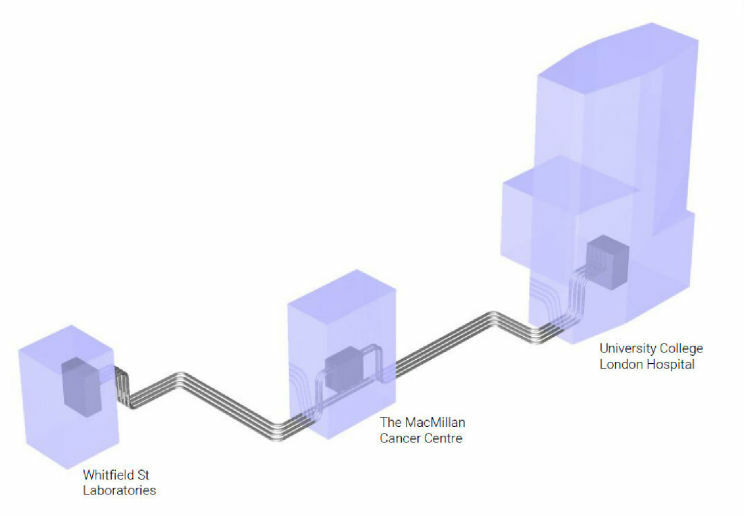 The connection now consists of 2 “train” systems directly connecting between UCLH and Laboratories, and 2 “train” systems that serve the Cancer Centre en-route. Each “train” system is capable of transporting up to 5 carriers simultaneously in each tube section, although demand generally does not require that more than 3 carriers are transported simultaneously. The equipment used throughout the installation is Quirepace “Minerva”. This system is completely flexible and can be configured in almost any conceivable layout; the software manages and manipulates the carriers between sender and receiver through the many independent systems forming the PTS network. Within UCLH itself, a network of 8 systems transports carriers around the building between the various wards and departments and the central plant area where the carriers cross over on to the “train” systems for transport to the remote buildings. With around 3km of pneumatic tube dedicated to the systems connecting the various buildings, Quirepace have demonstrated that whilst Pneumatic Tube Systems may be an “old” technology, they are still the most efficient and cost-effective method of transporting small payloads over considerable distances.